Hermit crabs make entertaining pets for kids, but this little creature demands a great deal of maintenance. And since they like to live in colonies, the large tanks that replicate their natural environment take up a lot of room. Add to that the possibility of aggression, stress, and infection—all contributors to "shell evacuation"—and suddenly a kid's pet becomes a parent's responsibility. That said, discovering your hermit crab left its shell isn't necessarily an indication that something is wrong. Shell evacuation is a common part of hermit crab growth. But along with this shedding of a layer comes the work of both a detective and caretaker. It's up to you to decipher why this happened and make sure your crab finds a new home fast. Shell evacuation happens when your crab needs to "trade up" both its housing and its exoskeleton in order to accommodate its larger body size. That said, not all who abandon ship are molting. 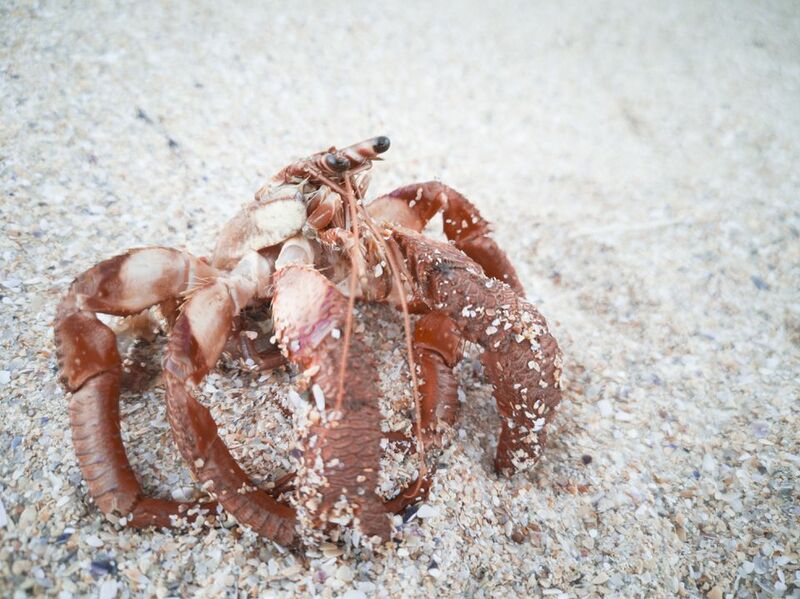 Stress, an inhospitable environment, and uninvited company can all cause a hermit crab to shed its shell. When this happens, your homeless crab suddenly becomes exposed to his surroundings, leaving it lethargic. Sometimes, sitting back and watching is all you can do. But by providing protection and a choice of upgraded abodes, you might be able to coax hermie back inside its armor. True—an unforeseen stressor may have caused your crab to leave its shell, but it could also be molting. If you notice your crab gorging itself on food and then suddenly stopping, trying to climb the glass walls of its habitat as if looking for a way out, dragging its shell or big claw, or excessively hanging out near the feeding water or makeshift pond, it may be exhibiting pre-molt behaviors. You may also notice your crab acting slow. Maybe its legs and body have taken on a light beige hue. Its eyes may appear to face outward and its antennae may have ceased activity. If you notice any of these symptoms and your crab's environment is impeccable, wait it out. Your crab may soon drop its exoskeleton. Sometimes evacuation is caused by factors other than molting, like a problem with your crab's environment. Humidity levels in its habitat could be too low or too high (ideal humidity ranges from 70 to 80 percent) or the temperature could be too hot. Another stressor that sometimes causes a crab to leave its shell is inaccessibility of the food dish. Is another crab playing bully and preventing it from eating? In a tank with more than one crab, housing scuffles can ensue. Crabs may fight over desirable shells and they have also been known to steal another's shell while the homeless crab was "trying out" an empty one. For this reason, ample shell selection, including various sizes, should always be provided, as one style may not suit a particular crab but may be perfect for its tank mate. There are some instances when the shell could irritate your hermit crab. Sand, mites, or other foreign objects can lodge themselves up in the shell, causing the crab to evacuate. Fungal or bacterial infections can also cause shell disease. However, this problem is usually remedied by a molt. When a hermit crab is out of its shell—either because of a molt or another environmental cause—it's stressed and vulnerable. Your crab needs protection from the other crabs in the habitat, as well as a little coaxing so that it will return to its shell. First, protect your hermit crab by moving it to an isolation tank or quarantining it by placing it under a large soda bottle (cut in half down the middle, air hole up). The isolation premises should have about 6 inches of a substrate so that your crab can bury itself and complete its molt. The molting cycle can take up to one month, so be patient. And make sure to provide easy access to food and water. Next, make sure your crab has a variety of new housing options by giving him a choice of appropriately sized shells. Some crabs are quite particular about the shape of the opening and the style of the shell, so try to source slightly larger shells with the same style to that of its prior home. Before placing the new shells in the habitat, wash them and brush off any debris, sterilize them for 15 to 20 minutes in boiling water, dry them, and then make sure there is there are no foreign objects lodged inside. After the shells are clean, mist them with a mixture of unchlorinated sea salt water and place them in the tank with your isolated crab. Watch your crab for a few days to see if it's cozying up to a new shell. You may have to remove a few shells for a day or two and then put them back into the habitat until your crab eventually chooses a home. Lastly, leave your crab alone and in the dark. The peace and quiet will, eventually, help it feel secure enough to try on another shell. You can prevent unwarranted shell evacuation by carefully caring for your crab and its habitat. To do so, first, make sure your hermit crab enclosure has ideal humidity levels. Humidity is critical to hermit crab health, as moisture helps them breathe through their modified gills. A hygrometer will help you assure your levels are appropriate. Also, mist your crab regularly (at least a few times a day) with warm distilled water to moisten the gills on the sides of its body. The crab habitat needs to have an unwavering appropriate temperature, as well. The ideal range is between 72 degrees to 80 degrees Fahrenheit. Maintaining this temperature will allow the substrate in your tank to hold a similar temperature gradient, keeping your crabs warm. To prevent shell rot (another common reason for shell evacuation), make sure your crab's environment has ample air flow, always feed it fresh food and remove any uneaten food before it grows mold, and clean and maintain both the substrate and the water regularly to prevent the growth of mold or algae.